While FAFSA’s IRS Data Retrieval Tool — used by millions of students each year to apply for federal financial aid — is temporarily out of commission, another online tool could be of use for students and parents planning their finances for college. A no-cost calculator from Nitro taps into actual college cost data to inform students of their ability to repay student loans. 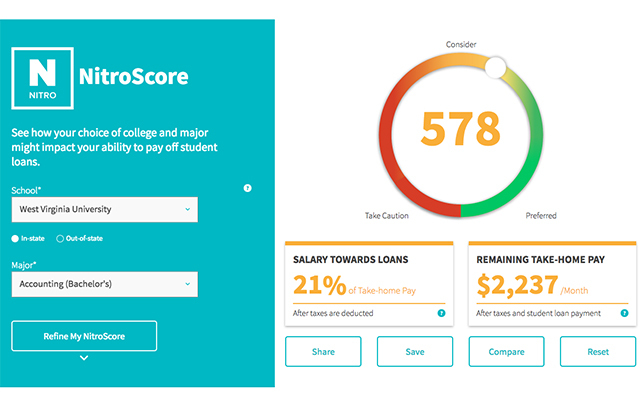 The NitroScore online calculator ranks college and major choices based on a student’s predicted ability to repay student loans after graduation. Families can compare schools, financial aid offers and majors to find an affordable option. And it’s straightforward: The lower the “NitroScore,” the more challenging it will be to pay back those student loans. For example: An in-state student who receives a $5,000 scholarship from the West Virginia University will have a NitroScore of 578 for accounting and 691 for computer science. So, if they choose accounting, 21 percent of their post-grad income will be used to pay back debt, compared to 14 percent for computer science. According to a NitroScore statement, the tool is “fueled by advanced analytics, proprietary data and individual consumer preferences,” as well as information from the National Center for Education Statistics and PayScale, an online salary, benefits and compensation company. Users can look at college costs for 4,138 higher education institutions in the United States, including data on tuition, room and board, supplies and other college expenses. They can also view salary data based on a PayScale survey of 1.4 million college graduates comprising 336 majors at four-year colleges and 140 two-year college majors.